On 2 February 2011, Ian Swales (Lib Dem, Redcar) addressed a Parliamentary Adjournment Debate on ME. During that debate, the Health Minister, Paul Burstow, had stated that the World Health Organisation (WHO) uses the composite term CFS/ME for this condition. This was incorrect. The WHO does not use the composite terms “CFS/ME” or “ME/CFS”. In a Parliamentary Written Answer to Mr Swales, dated 16 February, the Health Minister corrected his error . “…During the Westminster Hall debate, on 4 February 2011, I said that the World Health Organisation uses the composite term CFS/ME for this condition. This was incorrect. “The World Health Organisation classes benign myalgic encephalomyelitis and post viral fatigue syndrome under the same classification G93.3 ‘diseases of the nervous system’; subheading ‘other disorders of the brain’. “The report of the CFS/ME Working Group to the Chief Medical Officer, in January in 2002, suggested that the composite term CFS/ME be used as an umbrella term for this condition, or spectrum of disease. This term is also used by the National Institute for Health and Clinical Excellence for their clinical guidelines. But Mr Swales had misinterpreted the content of the Written Answer he had received from the Health Minister. This has caused much confusion amongst ME and CFS patients. Advocates have raised this misunderstanding with Mr Swales and with his Parliamentary Researcher. I am appending both versions. Paul Burstow, Health Minister, incorrectly stated on 2 February, during an Adjournment Debate, that the WHO uses the composite term CFS/ME for this condition. That error was corrected by Mr Burstow in his Written Answer of 17 February. Ian Swales, MP, then claimed in a website report that he had succeeded in getting the government to recognise ME and Chronic Fatigue Syndrome (CFS) as different illnesses. This was a misinterpretation of Mr Burstow’s own correction and clarification. Mr Swales’ Parliamentary Office has now amended his report. The Countess of Mar, meanwhile, tabled a Written Question of her own for which a response was provided on 1 March, by Earl Howe . But the Countess of Mar’s Written Question also contains an error. In the International version of ICD-10 (the version used in the UK and over 110 other countries, but not in the US which uses a “Clinical Modification” of ICD-9), CFS is not classified as a mental health condition under F48.0. Chronic fatigue syndrome is listed in ICD-10 Volume 3: The Alphabetical Index, where it is indexed to G93.3, the same code as Postviral fatigue syndrome. So in International ICD-10, Postviral fatigue syndrome, Benign myalgic encephalomyelitis and Chronic fatigue syndrome are all three coded or indexed to G93.3 under “G93 Other disorders of brain”, in Chapter VI (6): Diseases of the nervous system. In International ICD-10, the Mental and behavioural disorders chapter is Chapter V (5). So now you know what UK government policy is and that Mr Swales had misled himself. Perhaps the focus can now return to more pressing issues – like the fact that in the US, a Partial Code Freeze is looming for the forthcoming US specific version of ICD-10, known as “ICD-10-CM”. Under longstanding proposals, the committees developing ICD-10-CM intend to retain Chronic fatigue syndrome in the R codes, and code it under R53 Malaise and fatigue, at R53.82 Chronic fatigue syndrome (NOS), but propose to code for PVFS and ME in Chapter 6, under G93.3. Coding CFS patients under R53.82 will consign them to a dustbin diagnosis: there are no guarantees that clinicians will use the unfamiliar ME code or that insurance companies will reimburse for G93.3. It will make patients more vulnerable to the proposals of the DSM-5 Somatic Symptom Disorders Work Group. It will mean that ICD-10-CM will be out of line with at least four versions of ICD-10, including the Canadian “Clinical Modification”, and also out of line with the forthcoming ICD-11, where all three terms are proposed to be coded in Chapter 6 Diseases of the nervous system. There are only seven months left before the 1 October Code Freeze and the clock is ticking. Here is the first version of Mr Swales’ website report, followed by his amended version. Ian Swales MP’s fight for better treatment of myalgic encephalomyelitis (ME) continues as he succeeds in getting the Government to recognise ME and Chronic Fatigue Syndrome (CFS) as different illnesses. During Ian’s recent parliamentary debate on ME he argued that the Government needs to distinguish between Chronic Fatigue Syndrome and ME to provide better treatment for the different illnesses. However, Health Minister Paul Burstow MP responded by saying that the World Health Organisation classifies Chronic Fatigue Syndrome and ME as the same illness. Following an outcry from the ME community about this statement, Ian challenged the Minister on his definition of CFS/ME. The Minister admitted that the definition he used in the debate was “incorrect”. “I am pleased that the Government has now recognised that ME and Chronic Fatigue Syndrome are two different illnesses. “After the debate I received a lot of correspondence from the ME community about the Government’s definition of CFS/ME, so after doing some more research on the matter I decided it was right to clarify this point with the Minister. I know they will be reassured by this news. Ian Swales MP’s fight for better treatment of myalgic encephalomyelitis (ME) continues as he succeeds in getting the Government to acknowledge that the World Health Organisation does not use the composite term CFS/ME for the condition. However, Health Minister Paul Burstow MP responded by saying that the World Health Organisation “uses the composite term CFS/ME for the condition”. Following an outcry from the ME community about this statement, Ian challenged the Minister on his definition of CFS/ME. The Minister admitted that his statement was “incorrect”. “I am pleased that the Minister has acknowledged the error he made in the debate. In the November edition of LINK Newsletter (Issue 40), the Association of Young People with M.E. (AYME) has welcomed the decision by South West 2 Research Ethics Committee to grant ethical approval for the controversial pilot study around the application of the Lightning Process in children as young as 12. Lead researcher for the SMILE study (Specialist Medical Intervention and Lightning Evaluation), Dr Esther Crawley, is AYME’s Medical Consultant. To date, no rigorous RCTs have been undertaken into the safety, acceptability, short and long-term efficacy of the Lightning Process in adults. In a joint press release issued in August, two national ME patient organisations – The ME Association and The Young ME Sufferers Trust – condemned the study as “unethical” and called for the project to be abandoned. In a position statement issued in March, Action for M.E. had said it saw “no reason to oppose this pilot study”. Sir Peter Spencer is a non-executive director of the Royal National Hospital for Rheumatic Diseases, NHS Foundation Trust – Dr Esther Crawley’s employer and the hospital where this research study is being undertaken. The study hopes to recruit around 90 children aged between 12 to 18 and is expected to start this month. Half the patient cohort will undergo a three day course of the Lightning Process. 2] The names of all members of the External Advisory Group and the organisations with which they are associated, where applicable. Association of Young People with M.E. A favourable Ethical opinion has been given to a feasibility study which will see if it is possible to look at two different approaches to the intervention and treatment of chronic fatigue syndrome/ME (CFS/ME) in children. The project called SMILE (Specialist Medical Intervention and Lightning Evaluation) aims to find out if it is feasible to recruit young people into a study to compare specialist medical treatment with specialist medical treatment plus the Lightning Process for young people with chronic fatigue syndrome or ME (CFS/ME). The research team will be led by AYME’s medical advisor, Dr Esther Crawley, Consultant Senior Lecturer in the University of Bristol’s Centre for Child and Adolescent Health and Consultant Paediatrician at the Royal National Hospital for Rheumatic Diseases NHS Foundation Trust and is funded by the Linbury Trust and the Ashden Trust. AYME is aware that there are concerns from families about The Phil Parker Lightning Process®. However, around 250 children a year are already receiving the treatment, and it seems clear that large numbers will continue to do so. Many of the families that AYME supports have asked us about LP and it has been frustrating for us to be able to give them only limited information. We therefore, welcome this feasibility study to see whether a future study is possible. In addition, AYME is pleased to see the study group are looking at how much health resources young people with ME use and are also investigating the measures clinicians use to look at outcome. If the study is successful, not only will the team be able to apply for funding for a larger study to look at effectiveness, but they will also have a lot of data on the cost of CFS/ME as well as what we need to measure in future research. It is important to realise that only a larger study in the future will be able to investigate whether LP is effective or not which will enable children and young people and their parents and carers and to make an informed choice about LP. The study is using a mixture of interview techniques to understand what young people think about both interventions, including actually observing and comparing both interventions in order to understand more about them. The fact that all young people will be closely monitored by both the clinical and research team is reassuring. Esther Crawley said: “We are doing this study because so many young people with ME and their families asked us for this. We are very grateful we can now go ahead and start to answer some of the questions they have been asking”. The Phil Parker Lightning Process® is an intervention that is used for a variety of conditions including CFS/ME and has been developed from osteopathy, coaching and neuro-linguistic programming. It is a three-day training programme run by registered practitioners and designed to teach individuals a new set of techniques for improving life and health. Phil Parker, designer of the Lightning Process said: “It is vitally important that all interventions that could assist children with CFS/ME to return to school and improve their health are explored”. What ethical review has SMILE received? The study has been scrutinised by the South West 2 Research Ethics Committee whose role it is to ensure that research is safe and ethically sound. The ethics committee has looked in detail at the study design, and all associated documentation and suggested improvements to the readability and accessibility of the patient information leaflets and consent forms which have been adopted. The SMILE study is compliant with Good Clinical Practice Guidelines, Research Governance Framework, Medical Research Council guidelines, Royal College of Paediatrics and Child Health guidelines for the conduct of trials and has been approved by an ethics committee. Tabled on 21 October and due for answer by 4 November. To ask Her Majesty’s Government what assessment they have made of whether the decision by the South-West Research Ethics Committee to approve a pilot research study into the effects of the Lightning Process on children is consistent with the ethical guidance issued by the Medical Research Council to the effect that clinical trials should only include children where the relevant knowledge cannot be obtained by research on adults, and that research involving adults cannot provide the same benefits. Research ethics committees’ decisions are expected to be impartial and independent of ministerial and other influences. The Government do not interfere with their deliberations, either while they are in progress or by reviewing the outcome. The practice of research ethics committees is subject to training, accreditation and other quality assurance by the arm’s-length National Research Ethics Service to ensure the competence and consistency of their decision-making. It would be unethical if scientists did not seek to determine the safety and efficacy of treatments and care for all intended beneficiaries, male and female, young and old. When considering whether the particular sample of people proposed as research participants is appropriate, research ethics committees have regard to the established ethical principles reflected in the medicines for Human Use (Clinical Trials) Regulations 2004, international and professional codes of practice and guidelines from funding bodies such as the Medical Research Council (MRC), although the research project in question is neither a drug trial nor funded by the MRC. Which patient organisations were involved in the development of the SMILE pilot study? 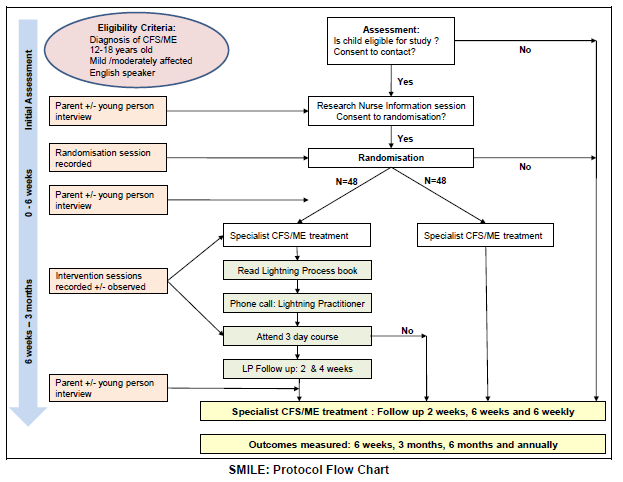 Which ME and CFS patient organisations were involved in the development of the SMILE Lightning Process pilot study in children 12 to 18 years? Given that this treatment is currently available, ME Association survey data suggests it has a similar profile to other therapies and the split opinions in the ME community (this study has the support of particular ME charities who have also been involved in its planning), we feel that a fair way forward is to seek the responses of the researchers, sponsor and the ME charities involved in the development of the study before asking the REC to review its favourable opinion. We also note that in this project, subjects will not be deprived of what is current care in this clinic. Research participants will receive this intervention in addition to their standard treatment. It is already known from the SMILE Research Protocol document that AYME has a seat on the External Advisory Group. But Ms Kirkbride’s statement suggests that more than one patient organisation may have been involved in the planning and development of this controversial pilot study. To date, there is virtually no information in the public domain about the proposed study design and methods and the research protocol is not expected to be published until the end of this month. a) What is Action for M.E.’s understanding of what will be applied to the children during the life of the pilot study and by whom? Where has it obtained the information on which it has based its decision to support this pilot study and to support any decision by the ethics committee(s) to grant a “favourable opinion”, ie, to approve the application? b) Would Action for M.E. please set out what information it has relied upon in order to inform its position on this pilot and whether the organisation has made any approaches to the researchers or to any other body to obtain information about the proposed study over and above the press release, and what was the outcome of any approaches made? Action for M.E. has not seen the research protocol for this proposal and has no detailed knowledge of the way in which this trial would be conducted if approved. We do, of course, want to see research into LP in adults too – but as children are already seeing LP practitioners, before the process has been subject to research published in respected peer-reviewed journals, we can see a case for investigating if it is feasible within the Ethics Guide to set up a controlled trial. The ME Association has written to the National Research Ethics Service (NRES) to ask them to clarify what action they are taking, or may be taking, in relation to concerns that are being expressed about this trial. “NRES has received the submissions from the ME Association and others concerning the SMILE study, a children’s study investigating treatment of ME in this age group. “Following our Standard Operating Procedures, we have collated the information we’ve received and will work with the REC to consider it. “Given that this treatment is currently available, ME Association survey data suggests it has a similar profile to other therapies and the split opinions in the ME community (this study has the support of particular ME charities who have also been involved in its planning), we feel that a fair way forward is to seek the responses of the researchers, sponsor and the ME charities involved in the development of the study before asking the REC to review its favourable opinion. We also note that in this project, subjects will not be deprived of what is current care in this clinic. Research participants will receive this intervention in addition to their standard treatment. “We will also be seeking the views of our National Research Ethics Panel. MEA editorial note: REC – in paragraphs two and three of Joan Kirkbride’s letter – stands for Regional Ethics Committee. Ed: Dr Esther Crawley is the Medical Consultant to AYME and AYME has a seat on the pilot study Advisory Group. Action for M.E. had denied any knowledge about the design of the pilot study. Where Ms Kirkbride refers to “the ME charities involved in the development of the study” it is unclear which patient organisations are being referred to.